The cornea is the clear front window of the eye that covers the colored iris and the round pupil. Light is focused while passing through the cornea so we can see. If the cornea is injured, it may become swollen or scarred, and its smoothness and clarity may be lost. Scars, swelling, or an irregular shape can cause the cornea to scatter or distort light, resulting in glare or blurred vision. In corneal transplant surgery, the damaged cornea is removed and a clear donor cornea is sewn into place. Ophthalmologists perform more than 40,000 corneal transplants each year in the United States, Of all transplant surgeries done today – including heart, lung and kidney — corneal transplants are the most common and successful. 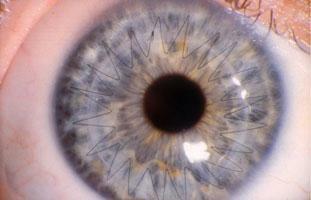 Complications from LASIK (lamellar transplants). What happens if you decide to have a corneal transplant? Once you and your ophthalmologist decide you need a corneal transplant, your name is put on a list at the local eye bank. Usually the wait is short. Before a cornea is released for transplant, the eye bank tests the human donor for the viruses that cause hepatitis and AIDS. The cornea is carefully checked for clarity. Your ophthalmologist may request that you have a physical examination and other special tests. If you usually take medications, ask your ophthalmologist if you should continue them. Surgery is often done on an outpatient basis. You may be asked to skip breakfast, depending on the time of your surgery. Once you arrive for surgery, you will be given eye drops and sometimes medications to help you relax. The operation is painless. Anesthesia is either local or general, depending on your age, medical condition and eye disease. You will not see the surgery while it is happening, and will not have to worry about keeping your eye open or closed. The eyelids are gently opened. Looking through a surgical microscope, the ophthalmologist measures the eye for the size for the corneal transplant.The diseased or injured cornea is carefully removed from the eye. Any necessary additional work within the eye, such as removal of a cataract, is completed. Then the clear donor cornea is sewn into place.When the operation is over, the ophthalmologist will usually place a shield over your eye. If you are an outpatient, you may go home after a short stay in the recovery area. You should plan to have someone else drive you home. An examination at the doctor’s office will be scheduled for the following day. Wear eyeglasses or an eye shield as advised by your doctor. Your ophthalmologist will decide when to remove the stitches, depending upon the health of the eye and rate of healing. Usually, it will be several months, at least, before stitches are removed.